In the penultimate episode of Grimm, our friends must face real evil in the world. 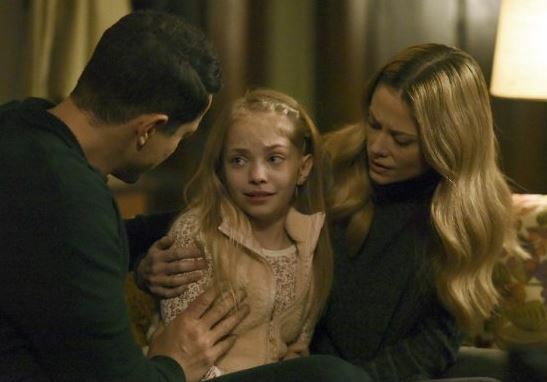 As Grimm 6×12 begins, Nick and Eve are still trapped in the other dimension, trying their best to fight the Zerstörer, who seems to be invincible. Even as an Hexenbiest, Eve doesn’t stand a chance against him. Meanwhile, in Portland, Monroe thinks he has found a way to bring the two back. It’s a solution Renard and Adalind don’t like, though, because it involves Diana using the magical stick to open yet another portal to the other dimension. At the spice shop, Rosalee, Hank, and Wu find something very important in some ancient German books. It appears that the Zerstörer set a trap for the Grimm. If a portal were opened now, the evil force would use this to get to Diana, who we learned in last week’s episode is his “child wife” and real target. However, at Monroe and Rosalee’s house, it’s already too late. Diana has just used the stick to open a portal for Nick and Eve, who manage to go through it – but the Zerstörer tries to as well. Luckily, it appears that the monster didn’t make it, since the mirror that Eve and Nick traveled through is now shattered into tiny pieces. Rosalee informs Nick and Eve about the Zerstörer’s plan, and they realize this very day was predicted by the symbols on the cloth. Today, something devastating is going to happen. As Grimm 6×12 continues, Nick and his friends have to find a place to hide and protect Diana. Nick comes up with an idea: The cabin in the woods where his adventure as a Grimm started, where he investigated his first wesen-related case, and where Renard gave him the first of the keys that led him to find the stick. Additionally, Rosalee thinks there could be a way to make Diana invisible to the Zerstörer using the Nuukh Suens, a ritual that conceals a child from harm. At the precinct, Hank and Wu search for possible warnings about strange creatures venturing in Portland. They don’t find any, but they do come across a report of two dead people – and a lot of bats. They decide to go and investigate. Back at the spice shop, Eve, Rosalee, and Monroe are studying some books that could help them in their fight against the Zerstörer when they receive an unexpected visitor: Trubel! Meanwhile, Nick is called in by Hank and Wu. The murder scene is a gas station with working surveillance cameras. Said cameras recorded the Zerstörer, who looks like a human being now. Elsewhere, Trubel is getting a recap on everything that happened since she left Portland, and she shares some news of her own: Black Claw is over. Together, they come to the conclusion that the Zerstörer’s big staff is supposed to help him make Diana his child bride and destroy the world as we know it. Eve says something about that staff has bothered her since the beginning. It looks cracked, as if it were put back together. Monroe finds a prophecy in one of his books that says that a staff broken into a hundred pieces was scattered throughout the world to keep its powers out of the hands of evil. Eve has a feeling that the stick is part of the staff. What if the Crusaders hid it in the Black Forest for the Zerstörer never to find it? Finally, the meaning of the stick is explained in Grimm 6×12! That’s probably why the Zerstörer is here – to retrieve that last missing piece. Shortly afterward, Eve warns Nick about the stick. He has to keep it under his control, since that little piece of wood is probably the only weapon they have against the Zerstörer. Back at the precinct, Nick, Hank, and Wu are processing all the information they could collect so far when Nick receives a call from Trubel. She has just seen the Zerstörer coming towards the precinct, and shortly after, they hear gunshots. The Zerstörer is inside the precinct! Hank, Wu, and Nick try to fight him, but his staff is too powerful for normal weapons such as guns. Wu tries to attack him but dies, along with Hank. Nick is left alone – his friends and the other cops are all dead. How is he going to stop the Zerstörer? Find out when Grimm returns to NBC next week for its series finale. What did you think of Grimm 6×12, “Zerstörer Shrugged”?